Storage is an important part of an application. And as web is now a application platform; storage options should be known. 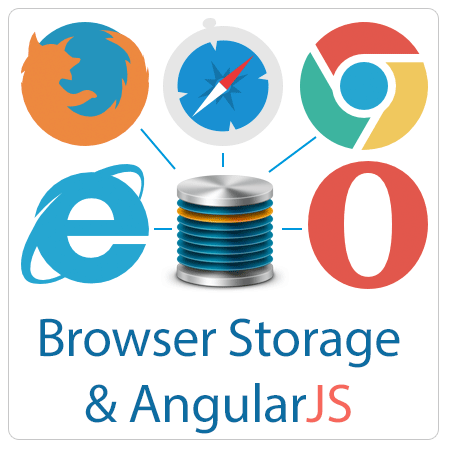 So we are going to discuss Browser Storage and AngularJS implementation of Browser Storage. So the client side storage; we will be dealing with; are sessionStorage and localStorage. And to handle these properly in AngularJS, we will also go through Factories and Services in AngularJS. The session storage is used to store the information that’s available for the duration of the page session. A page session lasts for as long as the browser is open and survives over page reloads and restores. Opening a page in a new tab or window will cause a new session to be initiated. And it is available to use as window.sessionStorage. To check whether you can use the sessionStorage or not; you can use window.Storage. 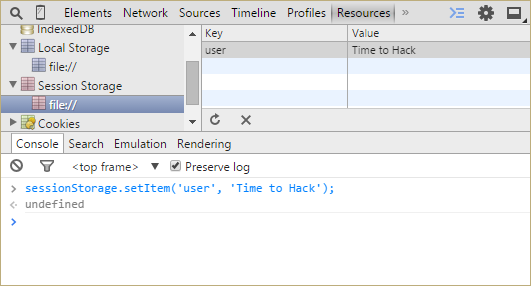 In AngularJS, nothing is available as a direct object to any controller or any handler function. As AngularJS had dependency injection mechanism; everything has to be passed as a dependency. 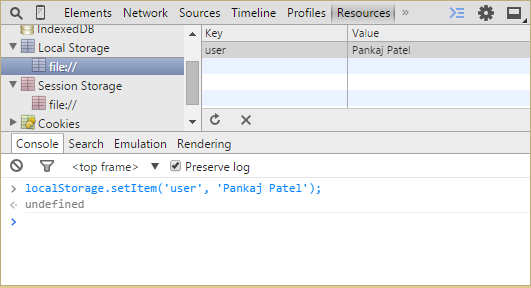 So to use Storage in our web app; we need to use it through the window object. And to use window object; we need to pass it as a dependency to out code blocks like controllers/factories as $window. And it will be very clumsy to handle data directly with $window passed as a dependency to controllers. So we will take the help of providers. Providers are the data interfaces in angular. You can create providers to interface your application from any source of the data. Source can be any remote location, REST API, device hardwares etc. Providers can be of various kinds like services, factories, values etc. We will create factory providers to access data from the Storage. These factories, which will create an easy interface for controllers to access data from local/session storage, will have access to the dependencies to access data from and will return an object. This object may contain other functions to facilitate sub methods like get, set etc. Here is the basic code for creating factory in AngularJS. Now lets see how the Storage works in browser. So initially we will check its availability i.e. local or session storage is available to use or not. For that we can check by window.Storage. setItem: This function accepts two parameters; first one is the name of the key and second one is the value that needs to be stored against the key; and thus function returns the status. getItem: This function accepts one parameter which is the name of the key and it will return the string value stored against that key. If it fails to get the value; then it will return false. removeItem: This function accepts one parameter which is the name of the key and it will remove that key. If it fails to get the value; then it will return false. clear: This function accepts no parameter and will remove all the items in the storage. In above code; we needed only session storage and only one key to be stored and updated; so refactored the factory code according to the todo app needs.